Classic Cosmo - the best! end up at the Ruth's Chris bar in Garden City on Friday evenings after a long, hard week of work. It is very conveniently located about a block from my office, in the same giant parking lot surrounding Roosevelt Field Mall. I usually order wine, which is discounted during happy hour as well, but a few months ago I had had a particularly stressful day and it was hot out, so I wanted something really cold and refreshing. 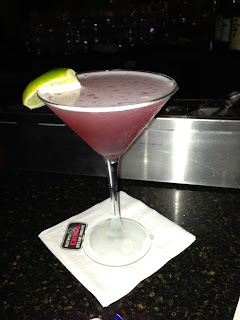 I ordered a Cosmopolitan on a whim, and it was one of the best drinks I've ever had. I have had Cosmos many times before, but Ruth's Chris makes them perfectly. Not too sweet and not too strong, and ice, ice cold. 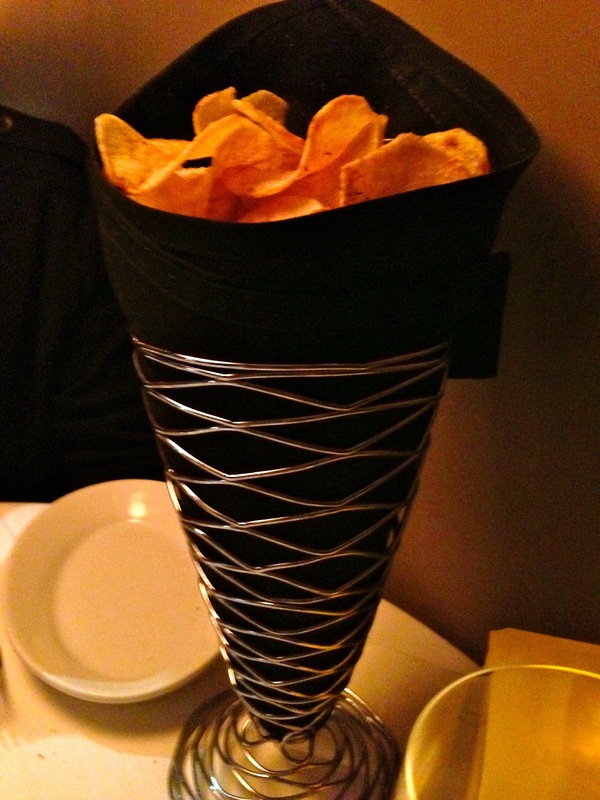 As for the happy hour menu, they offer about 6 or 7 appetizers for $7. Our favorites are the Filet Mignon Sliders, the Tenderloin Skewers, and the Spicy Lobster. And I must mention the delicious homemade potato chips that are always served at the bar - they are super crunchy and topped with a spicy Cajun seasoning. The only problem is that you absolutely cannot eat just one, I dare you! These things are highly addictive - you've been warned! I will start by discussing the Filet Mignon Sliders. They don't look that impressive when they come out of the kitchen, they are small and there are only two, but they are very good and surprisingly filling. I think the serving of fries, which are topped with salt and lots of pepper, help with that. 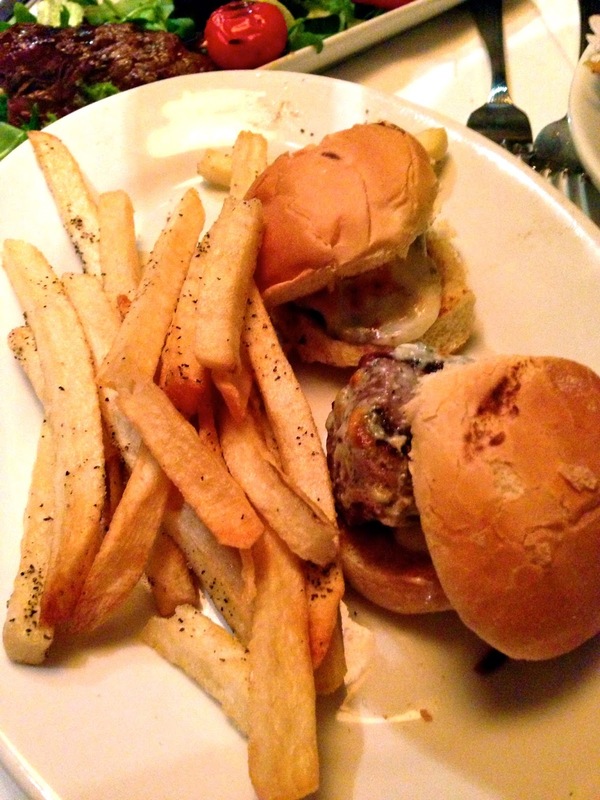 The sliders are my husband's go-to at happy hour, and he will often order more than one order so everyone can share. He usually adds blue cheese to them, and always requests a side of Ruth's Chris homemade au poivre sauce for topping the burgers. Au poivre sauce is a peppercorn brandy cream sauce that is out of this world. My husband is addicted to it. Another great happy hour item is the Tenderloin Skewers. Two large skewers of grilled filet mignon, with a sesame-soy glaze served over mixed greens. You can't beat the value here since you basically get at least 4 ounces of filet mignon for $7! The petite filet on the menu, at 6 ounces, is probably priced at nearly $40. Another dish we enjoy at happy hour is the Spicy Lobster, small pieces of lobster lightly tempura fried and tossed in a spicy cream sauce. Of course it's very rich, but it's served as a small portion and is meant to be shared. I also enjoy the Seared Ahi Tuna appetizer, which is another great value since you get a huge portion of ahi for $7! 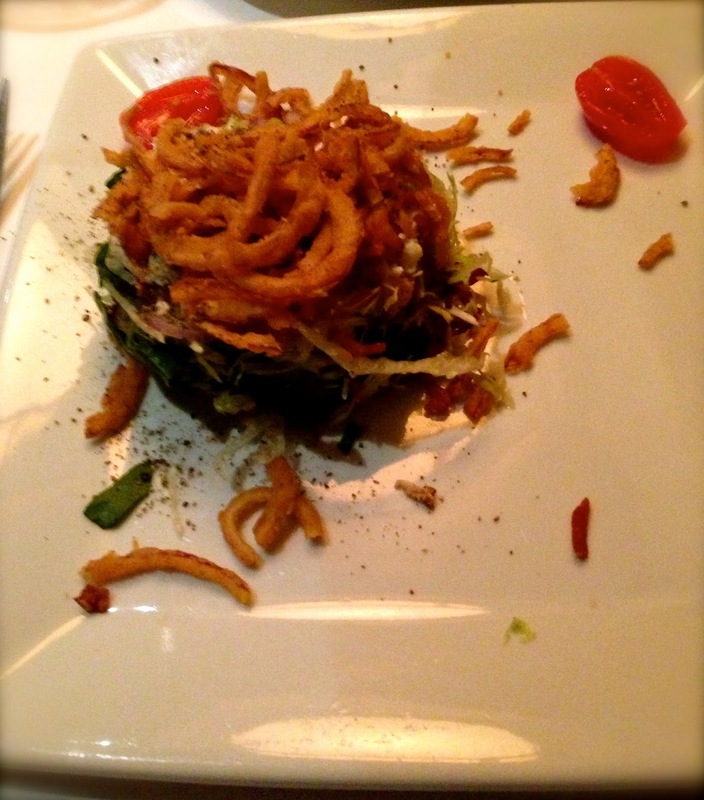 Ruth's Chop Salad - this is a half size! Even though it's not on the happy hour menu, I almost always order the Ruth's Chop Salad. It is one of the best salads I have ever had and I crave it when it's been a few weeks since I last had it! There are so many ingredients, here we go: very thinly julienned iceberg lettuce, spinach and radicchio, red onion, mushrooms, green olives, hearts of palm, bacon, egg, crumbled blue cheese, croutons and lemon basil dressing, all topped with crispy fried onions. I usually order it without the fried onions and the dressing on the side. This time around I ordered it with the onions on top so I could get a picture of it in all its glory because it definitely makes a statement. What I love about this salad is the way its presented. They chop up all the ingredients so finely and then mold them into this perfect circular shape. Once you dive in and start breaking everything up, it's actually a huge salad! It is the perfect combination of crunch (lettuce, croutons), richness (blue cheese, bacon, egg) and that salty zing (olives, hearts of palm) that I love in a salad. They were nice enough to split it for us, even though we didn't ask them to. Even the half portion is a good size! The Ruth's Chris bar in Garden City is a great place to unwind after a long day or week of work. You will encounter several other lawyers and professionals there doing just that. The bartenders are excellent - they are very friendly and professional, remember your name and more importantly, your drink.